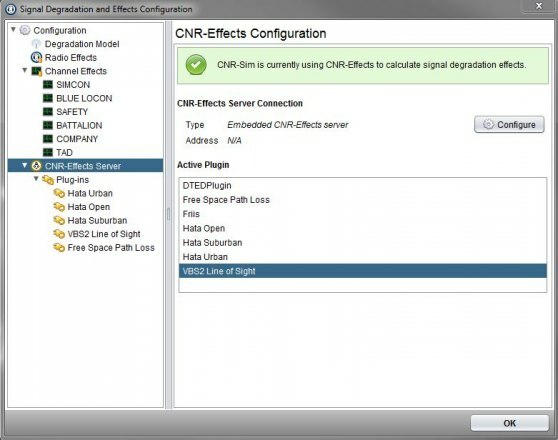 CNR-Effects adds physics-based effects of radio signal propagation and degradation to CNR-Sim Pro. CNR-Effects adds realistic radio sound degradation effects to the CNR family. CNR-Effects calculates radio signal propagation and degradation effects based on the real physics of radio transmissions and receptions. The effects on received signal quality depend on the transmitting radio's power and antenna, the radio frequency in use, intervening terrain (including Line Of Sight), the receiving radio's antenna, and other factors. The result is a far more realistic simulated radio environment.